Insect Groove, a showcase of work from 1992-2000 by Canadian electroacoustic composer, computer-assisted performer and improvisor Sarah Peebles, set up a rewarding interface between digital abstraction, group improvisation, 21st century programme music, Zen performance and ecological manifesto. Dedicated in no uncertain terms to the Elaho Valley in British Columbia, where a large region of forest is under threat from the timber industry, the album is visionary in its experimental merging of the primitive with advanced digital technology. This symbiosis, rather than split, is evident in Peebles's chosen tools: combining the shô, the ancient Japanese mouth organ with its cluster of bamboo pipes, and Macintosh Max programming, through which she accesses a wide range of samples and patches. Peebles herself, originally from Minnesota, spent some years living in Japan studying Japanese court and ritual music; hence her choice of shô, and her interest in performing alongside other musicians and artists who draw on the ritual traditions of the Far East, including Kô Ishikawa, also on shô, and Jin Hi Kim, on electrified komungo, a fourth century zither. It's testimony to the integrity of the sound Peebles pursues that the tracks here form a coherent series when their sources are so radically different "Drillbit Skiploop" assembles a brilliant mesh of thin, fibrillating electric drones, like a shoal of digital phones, that whirr and shuck and croak, holding just off from the regularity of a pulse. Lifeforms in tension. It is in fact one long treatment of a CD skipping. The ghostly throbbing and whining on "Higurashi in Yamanashi" sounds like a looped and distorted drone, but is a field recording of Higurashi cicadas from Kai Komagatake Shrine in Japan. Peebles's collaboration with David Toop from Hot Pants Idol fits effortlessly into this already Ballard-style mix of the wet and the wired: here the sho's resonance bleeds across more static throbs and whispers of interference and generator sounds. The same is true of the two performances included featuring the trio Cinnamon Sphere - comprising Nilan Perera on electric guitar and the calligraphic improvisations of Korean visual artist Chung Gong Ha. Though one can only guess at the visual wing of the performance, Perera's interests in Sri Lankan folk music and Harry Partch nicely match Peebles' own electricism and revision of the primitive. The duo, augmented by Ishikawa or Kim, mix tidal undulations of tone with the ability to pick out sharp flecks of texture in complex aural environments. Hover collects tracks from several performances of Cinnamon Sphere at various art and music galleries in Toronto and Guelph, Ontario, from 1996 to 1999. Perera's guitar is often bowed, sending out resonant, gong-like sounds, or hammered and teased with sticks to create shimmering tremolos, warps and glides. Into such fulsome but often metallic sounding vibrations. Peebles mixes birdsong; the abrasive resonance of the sho; glistening sounds somewhere between a glitch and a water sample; and again, those eerily gliding and rasping cicadas. Sounds seem to blossom effortlessly out of the electrified instruments and the Mac patches as it meditated into presence, but this is not insipid music. There is a poise and tautness and silveriness to its glide that comes perhaps from the terseness of Japanese ritual music. But the temple is also bent into hallucinatory four dimensional shape, the clarity strung out in tones that wobble, drift, twang and scintillate. Sarah Peebles's Insect Groove, (C74 007 CD) was reviewed at length as a CD-R in 2001 (The Wire 205). Its mixture of electronic, environmental and instrumental sounds offers a diverse set of negotiations between nature and the cultural formations through which we access the natural world; between musical tradition incarnated in ancient instruments and innovaton that is the lifeblood of electroacoustic composition; between words (a spoken text "White Powders/The Spiders" delivered expertly by David Toop) and nonverbal or ultra-linguistic states. Peebles's strength lies in her refusal to take soft fusion options or easy pastiche routes. Her music can be experienced from more than one perspective at a time. She opts to tap potentialities and keep them lively rather than serve up tepid resolutions. Korean musician Jin Hi Kim plays electric komungo, Ko Ishikawa plays the Japanese sho, Nilan Perera plays electric guitar. The outcome: stimulation, where bland platitudes too often rule the roast. Sarah Peebles performs with David Toop, Nilan Perara and Darren Copeland at The Annex Theatre Nov. 16. Sarah Peebles doesn't keep a busy release schedule, but as long as she puts out works this accomplished, this reviewer won't mind. Insect Groove is a delightful album blending field recordings, real-time electro-acoustic composition, and improvisation with real instrumentalists. Nature provides the main ingredients of this feast: buzzing insects, birds, water streams, presumably captured in the forests of British Columbia (Canada) to which the album is dedicated. To these sounds, manipulated and orchestrated by Peebles, a few select guests add their musical thoughts in the form of an open dialog. David Toop recites in "White Powder/The Spiders." Guitarist Nilan Perera, a regular partner of Peebles, appears on two tracks. Jin Hi Kim contributes some electric komungo (a Korean zither) in the title track, and Kô Ishikawa (of Otomo Yoshihide's Cathode fame) delivers a performance on shô in the last piece. The tiny mouth organ accompanies Perera's prepared guitar and samples of Tibetan bowls in a passionate yet very Zen improvisation. The submitted copy for review started with an uncredited 76 seconds of silence, after which "Nocturnal Premonitions" has all the desired room to startle the listener, sucking him into the composer's unique avant-ecological sound world. The back-and-forth movement between solo ambient, field recordings-based tracks, and "group" pieces establishes an easygoing pace. This album feels a lot less minimalist than Suspended in Amber. It has a lot to reveal to the attentive listener. Recommended. This album is dedicated to the world of insects. Sarah Peebles is electroacoustic music composer living in Canada. Beside the music, she also have interest in ecology, and in particular, she is worrying about threatening deforestation of Canada caused by increasing urbanization (as quoted inside the CD cover) The material of this album is mostly microscopic sounds produced by various insects, omnipresent but never seen. They are slightly reworked and processed by computer and then re-assembled into multi-part audiocollage. The result is more abstract than one can expect, even with occasional using komungo, electric guitar and japanese mouth organ - the acoustic instruments usually bring to sound some gentle and enliven flavour. This album could be just more detailed, more focused on soundquality version of Francisco Lopez works. Lopez' approach is more mystic (he is an entomologist, as you may know), but Peebles' approach is more naturalistic. Sometimes the composition is enriched by various external influences and effects, for example, the ridiculous orchestral samples or facilitated ethnic elements, but the central part is always occupied by micromusicians. The fantastic presence effect is reached, the intensity of musical movement is increasing like a dramatic tension of fabulous opera play. Did you ever to hide your head in the ant-hill? Well, the insect culture of Peebles is multilayered and has a strong hypnotic effect- maybe most evident in thr title-track. Five session-players are joined Peebles to create this mysterious journey, there are famous avantgarde musicians amongst them - David Toop and Jin Hi Kim. The highlighst of this album are realistic and exceptionally high quality of recordings. La compagnie Cycling '74, de San Francisco, fabrique des logiciels musicaux comme Max/MSP et fait paraître les enregistrements de certains des artistes qui les utilisent sur son étiquette C74. C'est le cas de Sarah Peebles, une électroacousticienne de la tendance "écologie acoustique" qui utilise beaucoup de sons enregistrés dans la "nature" (par exemple, des bruits d'insectes) pour fabriquer des paysages sonores grouillants de vie. Avec ses comparses David Toop (spoken word), Nilan Perera (guitare électrique préparée), Jin Hi Kim (komungo, une cithare coréenne) et Kô Ishikawa (shô japonais), elle peint des ambiances sonores contemplatives, faisant cohabiter des couches de textures évocatrices de la vie animale et des bruits qui semblent produits par d'étranges robots. Lancement à la SAT le 21 novembre à 19 h et 21 h 30.
interview met de Canadese componiste Sarah Peebles De Canadese componiste Sarah Peebles leverde een bescheiden meesterwerkje af op het kleine Californische label Cycling74, dat werk uitbrengt van artiesten die de muzieksoftware Max/MSP gebruiken om hun muziek te componeren. Peebles bevindt zich met het fijnzinnige Insect Groove in het selecte gezelschap van experimentele artiesten als Carl Stone, Tetsu Inoue en Kim Cascone. Insect Groove is een bijzonder geraffineerde collectie van insectengeluiden, traditionele Oosterse instrumenten en van door de computer gegenereerde klanken. Het album kwam er niet zomaar. Het bevat een verzameling tracks, die Peebles sinds ’92 componeerde. Insect Groove krijgt nu een verdiende, tweede kans. Het album werd in maart 2001 immers al eens in eigen beheer uitgebracht op Peebles' multimediaplatform Studio Excelo. Een enthousiaste Matt Ffytche in The Wire noemde Insect Groove toen Œeen perfecte combinatie van digitale abstractie, groepsimprovisatie, Zen-performance en 21ste eeuwse programmamuziek'. Lovende woorden, die hun effect niet misten. Cycling74 contacteerde Peebles om het album bij hen uit te brengen. Sarah Peebles: "Begin 2000 stelde ik een album samen in gelimiteerde oplage. Mijn partner (kunstenaar Robert Cruikshank, pw) maakte voor de hoes een etsachtige tekening van insecten. Ik heb iets met insecten! Iemand beschreef het geluid van de shô ooit als ‘geluid gevat in amber’. Ik vond dat een zeer mooie omschrijving. Robert is heel erg geïnteresseerd in driedimensionele fotografie. Hij werd gecontacteerd door fotograaf Wolfgang Wiggers. Wolfgang maakte foto's van insecten in barnsteen. Ik vond het concept leuk voor mijn tweede cd. Op mijn eerste Suspended In Amber had je een foto van amber met niks erin. Sindsdien experimenteerde ik met insectengeluiden. Het leek me een goed idee om de twee ideeën te combinerenŠ Ik stuurde enkele exemplaren naar tijdschriften en producers. Ik hoopte op die manier in contact te komen met een platenlabel, dat het album wou uitbrengen. ‘Insect Groove’ bevat hetzelfde materiaal als de cd op Excelo maar kreeg een ander hoesontwerp. In maart 2001 verscheen er plots een artikel over mij in The Wire. Ik was blij verrast dat ze het album zo goed vonden." De bal ging pas goed aan het rollen toen Sarah gecontacteerd werd door het productiehuis Cycling74, dat in ’97 werd opgericht door David Zicarelli. Het label ontwikkelt interactieve software voor artiesten of muzikanten. Onbekende en min of meer bekende componisten vonden reeds een stek op C74. Alle genres komen daarbij aan bod: van hedendaags klassiek tot pure elektroakoestiek. Gerenommeerde namen, die een album releasten op C74, zijn onder meer Kim Cascone, Carl Stone en Tetsu Inoue. "Ik kwam in contact met C74 toen ze me informatie opstuurden omdat ik hun muzieksoftware (Max/MSP, pw) gebruik. Ze stelden me voor om iets te releasen op hun platenlabel. Eerst was ik terughoudend omdat ze zo klein waren. Maar toen Carl Stone, Tetsu Inoue en Kim Cascone materiaal uitbrachten op C74, was ik meteen overtuigd. Ik vond het toen wel een geschikt moment om een plaat bij hen uit te brengen." In ’96 bracht Peebles, eveneens in kleine oplage, al eens een cd uit. Het moeilijk te verkrijgen Suspended in Amber kende veel bijval bij kenners maar bleef door de kleinschaligheid van de release grotendeels verborgen voor experimentele muziekliefhebbers. "Toch schreven mensen me van over de ganse wereld omdat ze meer van mij wilden horen. Ik nam dus de beste stukken en performances van de laatste jaren. Ik schikte en herschikte de composities tot ik een goed evenwicht vond. Eindelijk had ik een album te pakken, dat goed in elkaar stak en waar bovendien een overheersend thema in te vinden was. De rode draad zijn de gesamplede insecten, die overal op de plaat voorkomen. Op het eerste nummer hoor je higurashi's, een soort Japanse krekels die alleen's nachts tevoorschijn komen. Het derde nummer bevat vogels en krekels. Op het vierde nummer (met David Toop, pw) wordt er gepraat over insecten." Peebles, die oorspronkelijk afkomstig is van het Amerikaanse Minnesota, emigreerde in ’90 naar Canada. Tussen ’85 en ’93 bracht ze enkele jaren door in Japan, waar ze rituele en traditionele hofmuziek bestudeerde. Ze maakte er kennis met lokale muzikanten. Ze leerde er hoe ze Oosterse instrumenten moest bespelen. "Ik bracht in totaal ongeveer 2 jaar door in Japan. Maar ik bestudeerde de Japanse traditionele kunst en muziekscène al sinds ’85. Ik had geen meesterplan toen ik naar Japan reisde. Ik had wat hedendaagse muziek gehoord, die me beviel en die heel erg verschilde van de westerse muziek. Ik maakte er kennis met lokale artiesten. Ik vond daar een aanlokkelijke zienswijze. De kunstenaars zijn er zeer individualistisch en zeer onafhankelijk. Ze krijgen nauwelijks steun van de overheid. Het is interessant om te zien hoe ze daarmee omgaan. Ze helpen elkaar om installaties en experimenteel theater te creëren. 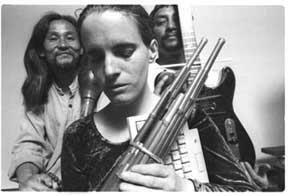 De resultaten zijn soms boeiend maar ook soms totaal oninteressantŠ"
Sarah Peebles bespeelt op Insect Groove vooral de shô, een traditioneel Japans muziekinstrument, dat gebruikt wordt om de gagaku, de traditionele hofmuziek, in te kleuren. Die Oosterse versie van het mondorgel heeft een etherische en bijna zweverige klank. Op Insect Groove vormen de hemelse tonen van de shô het overheersend timbre. "De shô is makkelijk om te bespelen. Maar als je het instrument echt goed onder de knie wilt krijgen, dan moet je toch wat oefenen. Het is geen blaasinstrument maar eerder de voorloper van het pijporgel. Het werkt zoals een accordeon of een harmonica. Een vriend in Tokyo stelde me voor om het instrument te leren bespelen. Hij behoort tot een gemeenschap van Shinto-priesters. Ik woonde ooit hun rituelen bij. Ik leefde naast hun schrijn toen ik hem leerde kennen. Ik ging met één van zijn vrienden naar een oefensessieŠ Ik leerde wat spelen en bestelde meteen een shô. Het instrument werd op maat van mijn handen gemaakt. Ik heb immers heel kleine handjes! Het is een aantrekkelijk instrument. Veel mensen willen het bespelen. Niet zo evident want je moet weten hoe je het moet stemmen en hoe je het moet onderhouden. Het geluid is zeer vluchtig en mooi alsof je in de hemel vertoeft. Het instrument intrigeert me. Ik probeer er altijd wat kwaliteit uit te krijgen. Meestal lukt het me niet!" Eén van de opmerkelijkste gasten op het album is de Britse experimentele muzikant en auteur David Toop. Hij leest een beklijvend fragment voor uit zijn boek Exotica terwijl Peebles er wat schrapende, insectachtige klanken tegenaan gooit. De samenwerking verscheen reeds op Toop's album Hot Pants Idol. Op 'Drillbit Skiploop' samplet ze bovendien nog een fragment uit diens Pink Noir cd. "We waren beiden gevraagd om een nummer te leveren voor een cd bij het tijdschrift Terra Nova. Het themanummer heette 'Music From Nature'. De samensteller van het tijdschrift organiseerde een driedaags festival in The Kitchen in New York. Veel van de aanwezige artiesten, zoals Paul Schütze en Clive Bell, kenden mijn cd Suspended in Amber. Zij zijn ook fans van gagaku of Japanse hofmuziek. David combineerde een lezing uit Oceans of Sound met zijn eigen soundscape. Ik ben heel erg geïnteresseerd om woorden op muziek te zetten of om een nieuw verhaal te vertellen. Ik kreeg de kans om met David samen te werken op Hot Pants Idol, de cd die samen met zijn boek Exotica uitgebracht werd." Peebles werkt op de cd ook samen met een keure aan muzikanten uit de voorhoede van de internationale, experimentele avantgarde. Shô-virtuoos Kô Ishikawa mag zijn kunnen demonstreren op het broeiende 'Listen to the Sound of the Sun Sinking into the Lake'. De Koreaanse Jin Hi Kim bespeelt op het titelnummer 'Insect Groove' de elektrische versie van de komungo. Peebles vormt al jaren een duo met gitarist Nilan Perera, die met zijn vervormde gitaarklanken een geheel eigen timbre geeft aan haar soundscapes. "Nilan is een improvisatiegitarist, die allerlei spullen gebruikt om zijn gitaar mee te bespelen. Hij creëert klanken die heel goed samengaan met mijn muziek. We werken al sinds ’95 samen in het improvisatieduo Smash and Teeny. Jin Hi Kim is een Koreaans-Amerikaanse componiste, die eveneens meespeelt in mijn groep Cinnamon Sphere. In dat ensemble combineren Nilan en ik improvisatie met de kalligrafie van visueel kunstenaar Chung Hong Ha. Jin heeft dezelfde sjamanistische kwaliteiten als Chung Hong. Ze bespeelt de komungo, een instrument dat een beetje lijkt op de Japanse koto. Het is een Koreaanse cither met een heel diepe klank. Jin is heel erg beïnvloed door verschillende Koreaanse muziekstijlen en raakt in trance wanneer ze speelt. Net als Chung Hong behoort ze tot een sjamanistische traditie. Ik vond het leuk om daarmee te experimenterenŠ"
Sarah Peebles presenteert maandelijks een eigen radioprogramma waarin ze plaats ruimt voor jonge, vrouwelijke componisten. Er lopen in Canada en elders nogal wat bekwame muzikantes rond, die volgens Peebles om een of andere reden door de media over het hoofd gezien worden. Ook de ongelooflijke, vrouwelijke souplesse waarmee Peebles zich van natuursamples, Oosterse instrumenten en computerprogramma’s bedient om een geheel eigen microuniversum te creëren, sloeg ons met verstomming. Met haar geraffineerde vrouwelijkheid slaagt ze erin om een brug te slaan tussen natuuropnames, liveimprovisatie en geprogrammeerde tonen. "Ik presenteer maandelijks 'The Audible Woman', een radioprogramma, dat zich toespitst op nieuwe muziek, gecomponeerd door vrouwen. Er zijn veel vrouwelijke artiesten, die heel erg actief zijn, zoals Natasha Barrett (zie nieuwe cd Isostasie op empreintes DIGITALes, pw), maar die te weinig aandacht krijgen. De redenen zijn heel complex. Eén keer per maand probeer ik hen onder de aandacht te brengen in mijn radioprogramma. We begonnen met de uitzendingen aan de University of Michigan. Eén van mijn profs presenteerde het programma ŒClassical Women'. Ik nam het programma over en veranderde de naam in 'The Audible Woman’. Ik weet niet of ik schrijf of componeer vanuit een vrouwelijk standpunt. Ik kan dat niet beamen! Als jij het zo aanvoelt, dan zal het wel zo zijnŠ Ik ben er me wel van bewust dat ik heel intuïtief componeer. Op school moesten we vooral vormen en structuren respecteren. Dat is niet de manier waarop ik de dingen benader. Ik werk heel intuïtief. Ik voel heel sterk aan wanneer iets af is of niet. Ik voel instinctief aan of iets verbetering nodig heeft of niet. Ik bewonder iemand als Robert Normandeau (op empreintes DIGITALes, pw). Ik sta altijd versteld hoe verfijnd en geraffineerd zijn composities in elkaar steken. Ik zag ooit een optreden van Fred Frith en ik kon mijn ogen niet van hem afhouden. Als ik naar hem luister, voel ik dat ook. Hij heeft een aparte manier van intuïtief componeren! Het is net dat verschil tussen componeren en improviseren dat mij zo aanspreektŠ"
Insect Groove van Sarah Peebles is nu uit op Cycling ’74. They should prescribe the Juno soundtrack for depression. That and a copy of Top Secret! And ice cream. Sarah Peebles, Insect Groove. Whirring electroacoustic sound art from one of Toronto's most respected experimental composers. Bugs as machines, machines as bugs? Chirps, squishes and other eco-samples from the B.C. rainforests blur with fluttering electronics, Japanese mouth organ and streaks of shortwave radio – along with the transporting words of David Toop – on a series of 2002 pieces that entrance all the more because they frequently flirt with the limits of audibility.